I had a chance to recently compare 5 USB cables in my system. I thought it is quite an interesting experience and so I just want to share. 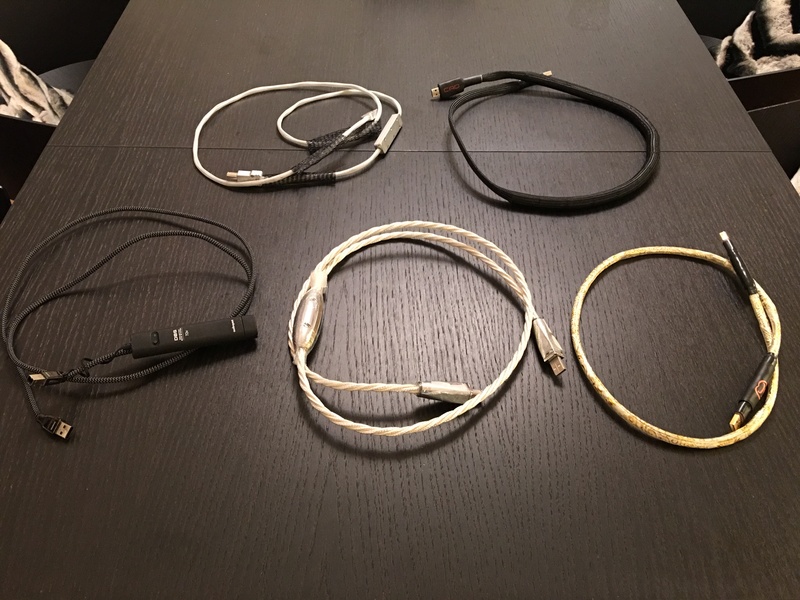 The 5 cables, in ascending order of price, are 1) audio quest diamond 2) computer audio design (new high-end version) 3) vertere HB 4) crystal cable absolute dream 5) skogrand beethoven. 1. The difference a USB cable can make is tremendous. In my view the difference is really much bigger than normal digital cables (AES/EBU or Spdif) and even more than interconnects. I used to have a hard time investing in a good USB cable because usually they look flimsy, and my bias was that USB cables should be cheap. But simply from an impact point of view I now realize there is a good case to invest in a good USB cable. 2. More expensive USB cables are NOT necessarily better. Obviously this is true for interconnects, speaker cables, power cords etc., and AE is renowned for finding products that are best-in-class but also value for money. But I would argue that in the "interconnect" world if cableA is 5x more expensive than cableB, it is highly unlikely that cableB can comprehensively better cableA. But in the USB world, (in my subjective opinion) CC absolute dream is "beaten" by a cable that is 1/3 its price, Vertere HB, which is in turn beaten by the USB cable of Computer Audio Design that is 1/2 of Vertere's price. I think there is more technology and expertise in USB cables beyond using exotic materials, different material geometry and elaborate shielding. 3. Skogrand Beethoven is a "marvel". It is so much better than the rest of the field. I don't know why this could be the case. The cable is so anti-cable (so light and no "bling"), but it is better than the rest in all aspects. Thanks for sharing. That is very useful guide. My experience is that USB cable is just as important as any other cable. But the most important cable that makes the biggest improvement is the ground cable in my system. And like you, I also can't escape the Skogrand Beethoven USB. I also invested in a pair of Beethoven interconnect. They are stunning. Thank you for sharing a very insightful comparisons among these USB cables. was wondering if you had any experience with Uptone Regen, Wyred 4 Sound USB recovery or Intona? Have seen other forums praising these gadgets with more ordinary USB cables, but not seen them working with the more exotic USB cables such as Vertere HB or Skogrand. I am for some reason now obsessing over usb cables, I have a pretty modest setup and am currently using an Albedo Monocrystal USB. Still testing and so far YourFinalSystem cable seems like a giant killer -> beat the JCAT and 1/3 of the cost. I am thinking of pulling the trigger on a Hemingway Audio USB interconnect, it is very expensive but I've heard very good things. Has anyone had any experience with Hemingway Audio? I got a Hemingway Audio USB cable to try out and it just blows away any of the other cables I have and my reference. The YFS Custom Reference and Albedo were both very good and close to each other (both broken-in) but the Hemingway brand new out of the box just left everything else in the dust. Some serious South Korean engineering going on inside this cable. Top to bottom, for me everything was perfect and not lacking in any area (speed, attack, width/height/depth, neutrality, presentation). Interested to see what it can do after 2 days which is the expected break-in time.